In the past two decades, there has been hyper-inflation in conductor's fees, increases that are out of all proportion to general inflation and the economics of musical activity. The increase is notable in their salaries, but most strikingly in the fees that conductors command for guest performances. Any of the top dozen maestros can expect around twenty thousand dollars a night for appearing on a major American podium, slightly less in West Europe countries, and up to four times as much in Japan. Who was that authoritative journalist? It was a certain Norman Lebrecht in his book The Maestro Myth. So now classical music has a double standard. A fee of $20,000 plus is acceptable, but only if you keep your nose clean. Gross remuneration differentials between celebrities and rank and file musicians are invidious and must be tackled. Sexual abuse is a terrible crime that must be eradicated from classical music. 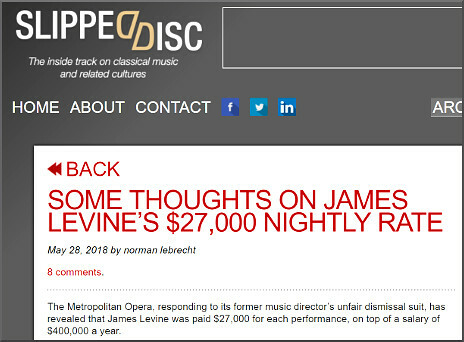 But shamelessly exploiting the lamentable Levine saga to impose a double standard with the sole aim of producing juicy morsels of click bait is also abhorrent. When will someone from within the classical music industry finally have the balls to say that? On An Overgrown Path is no longer linked on social media. New posts are available via RSS/email by entering your email address in the right-hand sidebar. Any copyrighted material is included as "fair use" for critical analysis only, and will be removed at the request of copyright owner(s). Yet another example of a toothless classical music industry getting precisely what it deserves.